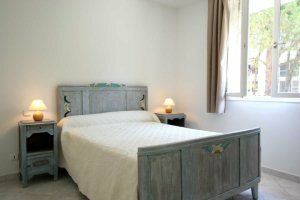 Résidence Bervily has two attractive apartments and six terraced houses situated in a large mature garden just a 10-minute walk from Calvi. Set in a large mature garden right in the heart of Calvi town, the résidence Bervily consists of just six attractive terraced houses and two apartments that are ideal for a family holiday. Simple in design but with some lovely features, these properties are well maintained and kept to a comfortable standard by the owners who live nearby. The gardens are well kept with an abundance of palm trees and Mediterranean plants providing shady areas for children to play, and there are plenty of sun loungers around the large pool area. Each property is equipped with air-conditioning and has its own private terrace suited to al fresco dining. The maisons are clustered near the pool area, each adjoining the large lawned gardens, and therefore suit parents wishing to keep an eye on the children whilst still being able to relax. For those seeking a bit more privacy, the two apartments are positioned slightly further away from the pool – set on one level, they also have a large enclosed terrace. Ideally situated in Calvi, it takes approximately 10 minutes on foot down a quiet path to reach shops, restaurants and a gently shelving sandy beach. 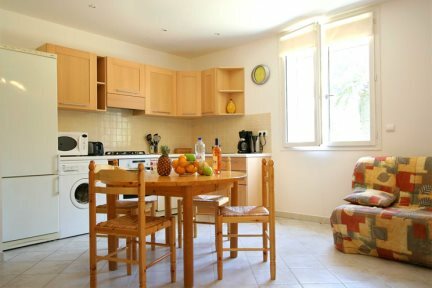 Apartments Bervily are a popular choice with our guests year after year. Apartment Murier: Open plan living/dining room with kitchen area, bathroom, separate wc, twin bedroom, double bedroom, terrace. Apartment Sereingat: Living/dining room, kitchen, bathroom, separate wc, twin bedroom, double bedroom, terrace. Kitchen, lounge/dining room, bathroom, and separate wc, twin bedroom, double bedroom, terrace. Open plan lounge/dining room with kitchen area, bathroom, and separate wc, twin bedroom, double bedroom, terrace. Calvi town's social life focuses on the many restaurants and cafés of the Quai Landry which is a large seafront walkway that links the marina and the port effortlessly. To get the best possible feel of the town, this is the place to be! A walk up through the narrow passageways off quai landry will take you to rue Clémenceau where you will find an array of restaurants and souvenir shops plenty. Further walking will present the Ste-Marie-Majeure, built in 1774 and from this a flight of stairs will introduce you to the modern high street which is the point of entry to the wonderful citadel. Wherever you are in Calvi Town, you will never be short of inspiration for a bite to eat. The Marina offers a host of seafood options, the more inland streets present pizzerias and Corsican restaurants and of course the cafés complete the variety. Calvi's beach is a huge sweeping crescent of white sand fringed by woods of planted maritime pines and it has something for everyone: it is patrolled by lifeguards in the summer and has a gentle shelving gradient that is perfect for all ages, including toddlers. It boasts a fine array of restaurants and cafés nearby - some of which serve directly onto the beach whilst you bask on your sunlounger; not to mention a diverse range of water sports activities for the more energetic. At this headland, just three kilometres west of Calvi Citadel, there is a sandy beach and tiny coves which can only be reached on foot or bike. A great, more secluded alternative to the town beach that gives an idea of the wilder coastline to be explored on the west coast of Corsica. A picturesque and secluded beach that can be reached by train or by a two hour walk along the coast. Backed by macchia and pine trees, swimming conditions are perfect at Ste Restitude with soft sand and clear water. There is a restaurant serving refreshments but little else. This festival held in July is a youthful music and arts festival with a mix of electronic music and digital art and includes a concert each night in the citadel. Polyphonic singing is at the heart of Corsican culture and musicians from around the world perform in the citadel at this event. Held in Lumio in mid July, this is a village festival with exhibitions celebrating stone-masonry and stone-related crafts made in the village from iron ore mined on Cap Corse. Around 10,000 visitors honour the olive in July, in a delightful olive grove setting with exhibitions demonstrating olive production over the years and artisans selling refreshments and local produce. Held in the Balagne village of Aregno every August, the Foire de l’Amandier includes tastings, painting exhibitions, events for children and cooking contests all based around the almond and its trees. Calvi has so much to see and do, there is something to suit everyone! If you don’t mind the climb to the top through the cobbled streets and narrow alleyways, then a visit to the citadel is a must during your holiday. From here, the views across the bay to the mountains are magnificent. For energetic music lovers, walk up to Notre Dame de la Serra to listen to the violinist playing in the chapel. At 216m above Calvi, you will also be rewarded with fabulous views across the bay below and don’t forget to take water, a hat and sun cream. Each week held at the Cathédrale Saint Jean-Baptiste, which stands at the highest point of the Citadel you can experience Corsican Polyphonic singing with the concerts of “Chansons polyphoniques”. There are a number of places in Calvi where you are able to participate in ‘on the water’ activities. Waterskiing, motorboats of all sizes, parascending and jet-ski hire to name but a few, plus English speaking instructors are available for windsurfing, sailing and kitesurfing. All these activities are bookable in advance through local companies. Taking a train journey is a delightful and different way to experience the varied and wonderful landscapes of Corsica. This regular service allows you to explore the coastline to the east of Calvi, stopping at all of the beaches en route. The line built in the 1880s and 1890s hugging the coast is undoubtedly one of the worlds most scenic railways. The journey takes approx 50 minutes, and depending on the time of year travelling, there are between five and 10 return journeys a day. Take a coach trip for half a day around the old Balagne villages, or take a full day to travel a little further afield. Perched high above the sea, the fortress villages of the Haute-Balagne offer dramatic mountains landscapes and spectacular views over the coastline. Stop en route to sample the local produce or visit one of the workshops along the craft trail "Strada di l'Artigiani". Explore the Bonifato forest, a spectacular pine forest with hidden rock pools and stunning views over Calvi bay with walks of varying difficulties.